Weekly rail traffic in the U.S. rose 2.4 percent for the week ending March 18. U.S. railroads moved 495,281 carloads and intermodal units for the week ending March 18, a 2.4 percent increase compared with the same week last year, the Association of American Railroads (AAR) reported yesterday. Railroads logged 246,465 carloads, up 4.6 percent year over year, according to the AAR. 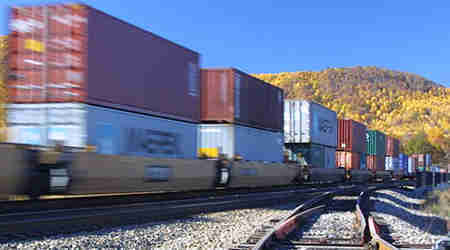 Intermodal volume was 248,816 containers and trailers, up 0.3 percent. Four of the 10 carload commodity groups that AAR tracks each week posted increases compared with the same week in 2016. They included coal, up 18.9 percent to 77,123 carloads; grain, up 8.1 percent to 23,243 carloads; and nonmetallic minerals, up 3.3 percent to 33,255 carloads. Commodity groups that posted decreases included motor vehicles and parts, down 13.8 percent to 16,621 carloads; petroleum and petroleum products, down 9.3 percent to 9.655 carloads; and miscellaneous, down 5.9 percent to 9,237 carloads. For the first 11 weeks of 2017, U.S. railroads reported cumulative volume of 2,803,485 carloads, a 4.9 percent increase from the same point last year. Cumulative intermodal volume came in at 2,854,161 units, up 0.2 percent. Meanwhile, Canadian railroads reported 81,651 carloads for the week, a 12.4 percent year-over-year increase. Canadian railroads' intermodal traffic rose 11.4 percent to 60,051 containers and trailers. For 2017's first 11 weeks, Canadian railroads logged 1,531,393 carloads, containers and trailers, up 7.9 percent compared with the same period last year. Mexican railroads' weekly traffic increased 3.9 percent to 17,176 carloads, while intermodal volume inched up 1.7 percent to 10,185 units compared with the same week last year. Cumulative rail traffic in Mexico for the 11-week period slipped 2.4 percent to 289,794 carloads and intermodal units compared with the year-ago period.